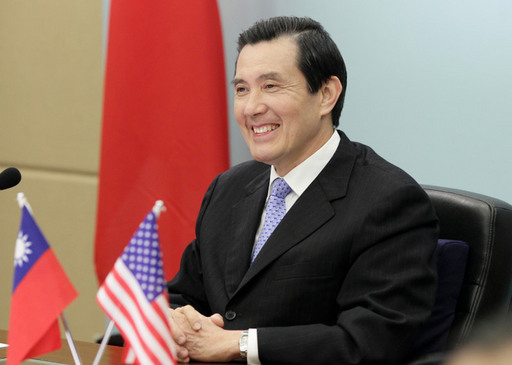 Taipei, April 16 (CNA) President Ma Ying-jeou said Tuesday that the improvement in relations between Taiwan and China is consistent with the interests of the United States. Ma said during a one-hour video conference with U.S. academics that Taiwan has greatly improved its relations with the mainland and greatly reduced tensions between the two sides of the Taiwan Strait since his administration took office. "That is certainly in the interests of the United States," he said. The president was responding to a question by former U.S. Secretary of State Condoleezza Rice, the moderator of the conference, on whether the improvement in Taiwan-China relations would change the nature of the relationship between the U.S. and Taiwan. Rice said that in 2008, when she was still secretary of state, the U.S. was very supportive of the idea of improving cross-Taiwan Strait relations and felt it had a big stake in peaceful relations between Taiwan and China. In his speech, Ma said some people in the U.S. have expressed concerns that as China rises, Taiwan might someday entrap the U.S. in an unnecessary conflict with the mainland. Others fear that Taiwan is tilting toward China, thus abandoning the U.S., he said. "Both arguments imply that the United States should reduce support for Taiwan. But neither view is warranted," he said. "My administration's pursuit of rapprochement with mainland China has clearly helped preserve and enhance peace in the Taiwan Strait." During the conference, Ma also highlighted the U.S. as an important trade and security partner, saying that Taiwan and the U.S. share the same values and interests in preserving regional peace and stability. The video conference was organized by the Center on Democracy, Development and the Rule of Law at Stanford University. Participants also included Larry Diamond, director of the center, Francis Fukuyama, a professor at Stanford, and Gary Roughead, former chief of U.S. Naval Operations. On the regional situation, Ma said in his speech that because of Taiwan's efforts to play the role of "a facilitator of peace," the Taiwan Strait is no longer one of East Asia's major flash points. In contrast, he said, the Korean Peninsula has experienced an unprecedented level of tensions since North Korea conducted a third nuclear test in February. He pointed to Taiwan's efforts to make progress in solving a territorial row over the Diaoyutai Islands, which are also claimed by Japan and China, saying that Taiwan had made a breakthrough in talks with Japan on fishing rights in waters surrounding the Diaoyutais. "This time, both sides decided to shelve their respective territorial and maritime claims regarding the Diaoyutai Islets, and to jointly conserve and manage fishery resources in the East China Sea," Ma said. "This agreement marks a historic milestone in the development of Taiwan-Japan relations and sets a good example for how the concerned parties can find ways to preserve peace and stability in the region," Ma added. A Taiwan-Japan fishery agreement was signed on April 10, under which Taiwanese fisherman gained an additional 4,530 square kilometers of waters in which they can operate without interference from Japanese authorities. Taiwanese fishing boats, however, are still not allowed within 12 nautical miles of the Diaoyutai Islands, according to the agreement. Ma also outlined his "East China Sea Peace Initiative," which he proposed in August last year to deal with territorial disputes in the East China Sea. Under the proposal, Taiwan, Japan and China would hold separate bilateral talks before moving on to trilateral negotiations. "It will be very difficult to begin with a tripartite negotiation, so we divided that into two phases," Ma said. The Taiwan-Japan fishery agreement has demonstrated how Taiwan can handle a crisis situation and reach an agreement without sacrificing each other's territory and sovereignty, the president said. "National sovereignty cannot be divided, but natural resources can be shared," he said. Ma hoped the improved relations between Taiwan and Japan could establish a model for the other two sets of bilateral talks. In fact, he said, Japan is ready to conclude a fishing agreement and an agreement on resource development with China in the East China Sea, while Taiwan is also working with China on sea rescue plans and joint oil development in the Taiwan Strait. "So we do have some basis for bilateral negotiations. This is probably the only way to reduce tensions in the East China Sea," Ma said. "As you can see, we pay a lot of attention to being a role of a peace facilitator," he said. "We reduce tensions between mainland China and Taiwan, and we also try to reduce tensions between Taiwan and Japan regarding fishery issues."